AUSTRALIAN wool prices firmed further this week, with values lifting mainly for fine Merino and all crossbred fleece. The benchmark AWEX Eastern Market Indicator lifted six cents 2094c/kg clean, with brokers passing in 2.7 percent of the 34,064 bale offering, 4452 fewer than last week. AWEX senior market analyst Lionel Plunkett said on Wednesday the EMI came tantalisingly close to breaking 2100 cents for only the third time; however, the 9-cent rise on that day saw it fall short by three cents before it eased by a similar margin on Thursday. “Trade interest this week was focussed on the finer microns, which all added around 30 cents clean over the three days. “The better types continued to attract attention amidst the drought in the eastern states affecting the offering,” he said. “Whilst key staple measurements (including strength and position of break) for Merino fleece types remain healthy, yield is showing the results of the dry and is around 2pc lower (66pc) when compared to the same time last year (68pc),” Mr Plunkett said. He said the broader types (20/21/22 microns) were approached more cautiously and these tended to lose ground, particularly on the final day. “Merino skirtings were reasonably resilient during the week and generally closed ahead of the previous sale. “Crossbreds also lifted, while Merino Cardings were generally a touch softer,” Mr Plunkett said. 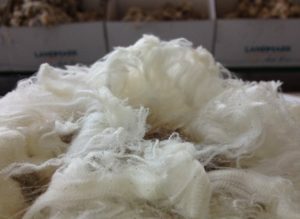 Australian Wool Innovation’s weekly market report said a lot of inactivity in the market this week was due to the wait and see approach that inevitably comes each year around the Nanjing Wool Market conference week. This event usually provides a strong lead as to the short to medium term market direction and a week or two post conference is required for that direction to become apparent. AWI said what is most apparent in the Australian Merino wool market is the disparity of prices achieved between selling centres. “Whilst all markets are generally aligned from 19 to 22 micron, the real differences become quite obvious on the superfine descriptions of 18.5 micron and finer. AWI said supply issues are the main concerns at present, with AWEX selling figures showing that almost 50,000 fewer bales had been put up for sale in Australia this year than in the period last season. “This represents 13.4 percent less than last year (2017/18) when at the similar time there was 10pc more wool than the previous year (2106/17) at that time, which by season’s end had dwindled to just a total improvement of 2pc or thereabouts. “If the same seasonal pattern is followed, then justifiable concerns can be made for the outlook of much more significant supply drops than is currently being estimated, and that’s of course given that the drought situation doesn’t escalate further,” AWI said. AWI said the major issues emanating from the NWM conference were the environmental protection legislation in China and the associated budgets required to satisfy the highly restrictive new laws. “The most effect is on scouring effluent and the waste water and sludge disposal. “Water treatment and air purification devices are required and expensive, adding significant cost to scouring of greasy wools,” AWI said. The trade war between USA and China was also a key topic at the Nanjing conference. At this stage textiles are caught up to an estimated 10pc impact of the total US$400 billion, with wool being caught up in $4 billion of that figure, AWI said. “Within textiles, thankfully for most of our wool growers, that impact is centred on industrial textiles and carpets exported to USA. Wool prices were also discussed at length and rather than complaining about the price, almost all China users are actively trying to adapt to the new price levels and to survive, AWI said. “Better management strategy and improving production techniques is their primary focus.